Alberto Sordi was born in 1920, started working in films in small parts as early as 1937, yet it wasn't until 1951 that someone gave him the lead in a film (MAMMA MIA, CHE IMPRESSIONE! - DEAR ME, WHAT A FRIGHT! 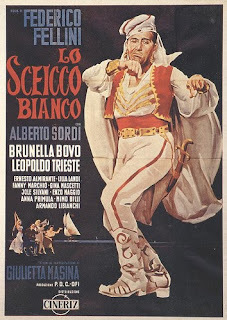 ), though it didn't open many doors for him until a year later when a director making his first film, Federico Fellini, had to fight with the producer to get Sordi for LO SCEICCO BIANCO (THE WHITE SHEIK). Unfortunately, Fellini's "opus one" was a complete flop, but when he made I VITELLONI (THE YOUNG STEERS) he insisted upon having Sordi for one of the leading roles. Success at last, both for the director and the actor, who managed to stand out in a film on a par with lots of able young actors (Franco Interlenghi, Leopoldo Tireste, Franco Fabrizi). A little later, an episode in the film UN GIORNO IN PRETURA (A DAY IN COURT) sketched out the specific contours of his personage, bringing him an enormous popularity. Yet if one looks at the twenty or so films he made before then, the talent of the actor was already fully apparent; suffice it to remember the go-getting clerk in LE MISERIE DEL SIGNOR TRAVET (THE MISFORTUNES OF SIGNOR TRAVET: 1946) by Mario Soldati or the sinister individual in SOTTO IL SOLE DI ROMA (UNDER THE SUN OF ROME: 1948). Why then did an expert actor have to wait some fifteen years in order to "make it"? The reason probably lies in the fact that he had not yet discovered his "personage" and his performances, however excellent, did not bring into focus a recognizable moral and psychological individuality, an "identity". He started his career, for example, under the wing of Oliver Hardy, when in 1937 he won the contest organized by Metro-Goldwyn-Mayer for the voice best suited to dubbing in Italian the voice of the partner of Stan Laurel. Laurel and Hardy were - and still are, thanks to television - highly popular in Italy. Sordi was able to gain access to the vaudeville stage precisely because he was presented as "the Italian voice of Oliver Hardy", whom he then went on to imitate. Breaking away from that model, he did a little of everything in the theater, capable, well-liked, but never really a celebrity. Since he was young and good-looking, during the war he accidentally co-starred in a heroic air-force film, I TRE AQUILOTTI (THE THREE YOUNG EAGLES: 1942) by Mario Mattoli, on a story by Vittorio Mussolini, the "Duce's" son. It was a completely "serious" role, which shows that producers had not recognized the actor's real talents. These talents gradually came to the fore, thanks to the radio. In his search for an "identity", he even went so far as to try success as a radio singer. But it was most of all with certain characters ("Signore Dice", "Count Claro", "Mario Pio", "the parish buddies") that the artistic individuality of Alberto Sordi irresistibly began to take shape: on the one hand, the big grown-up baby, on the other the saucy, aggressive wise guy. It would be the sum total of these two characters, which were poles apart, that would go to form the unique "personage" Sordi brought to the screen: a cocky young man, meddlesome, aggressive, who suddenly reveals unexpected reserves of immaturity, certain childish characteristics which offer a fertile terrain for his comic streak.